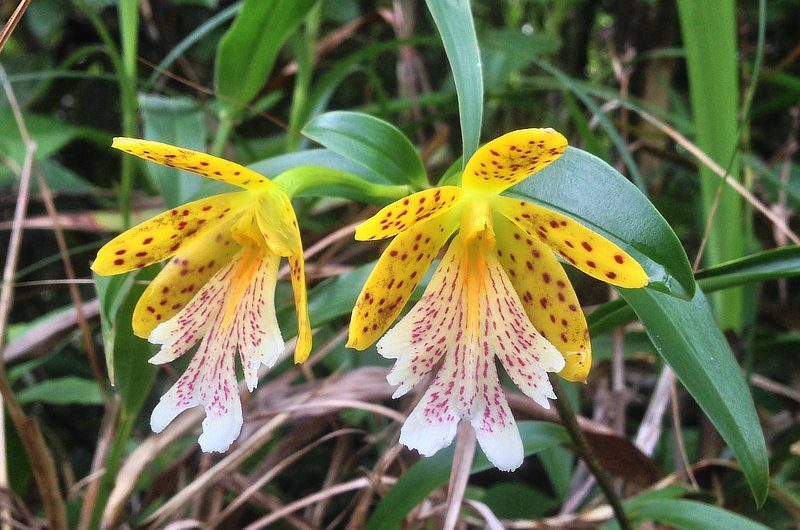 A beautiful orchid from the foothills of Central America, this species is blooming now in Panama! Epidendrum wallisii is one of several members of this genus that combine contrasting colors in a striking way. It produces elegant, thickish, waxy, fragrant flowers, often on short stems from nodes along the stout canes. The yellow and white flowers, with pink hues and speckled with purple, are up to 4 cm wide. Flowers are long lived, making them popular in cultivation. Leaf sheaths have prominent warts, a characteristic that occasionally separates it into a synonymous genus, Oerstedella. Epidendrum wallisii is both terrestrial and epiphytic. Wallis’ Orchid, named after German plant collector Gustav Wallis, is native mainly to the most montane forests of Mesoamerica, particularly Costa Rica and Panama. In Panama, Epidendrum wallisii is widespread, found in the foothill mountains around the Canopy Lodge and Cerro Azul, and on Barro Colorado Island.